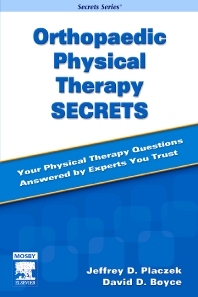 Part of the popular Secrets series, this helpful reference presents basic physical therapy concepts and then introduces different healing modalities, specialties and orthopedic procedures typically prescribed for common injuries such as shoulders and extremities. Common diseases are included as well as more innovative diagnostic tools for physical therapists such as radiology. Each chapter features concise information that includes the author's tips, memory aids and "secrets." Bulleted lists, algorithms and illustrations provide a quick review of the specific topic discussed. The information is entirely evidence-based, outcome based and up-to-date. All chapters provide an emphasis on outcome studies and evidence-based practice and include the latest research for the concepts presented. Numerous charts, table and algorithms summarize and visually portray concepts covered in the chapters to provide additional information for clinical decision making. Chapters are written by well-known contributors, including some of the best-known physical therapists practicing in the field today. Provides important information on topics covered in the orthopedic specialty exam. Includes detailed information relevant to making an accurate shoulder assessment as well as the most common shoulder disorders.